I thnk Nash was giving out speeding tickets! This morning after Nash had breakfast, we went out for his walk, and he was standing in the street, close to the curb, staring at all the cars flying by on 52nd street. I know that he is a curious fella, so I couldn’t really figure out what he was doing, he was just looking at all the cars flying by, so the only thing I could think he was doing is couting the cars that he would give a speeding ticket to. Then again, it was snowing, so maybe he was just enjoying the cool snow landing on him, as he looked quite happy. We got back inside, and thank God he is laying on my feet insetead of my bed, because he wasn’t covered in snow, but he was soak and wet. I did attempt to give him a thourough drying off, but after a few run through my legs, Nash had tired me out. He was mostly dry. Luckily, Nash lied down on my feet for awhile, and he was pretty dry by the time he made it back into my bed. Yesterday, we actually had some nice weather, and what I mean by nice, is the 40s, no rain, no snow, and most importantly, no wind. Since it was nice out, Nash and I worked the old school route since we had not done it in awhile. I wish I could say that he was fantastic with his route work, but unfortunately, he was back to his old sniffing ways on a few of the blocks. He did have some great blocks with no sniffing, and a very nice pace. I don’t know why Nash tries to eat everything in sight, I mean he is almost three. Can I sue the Family Guy? People think that is me? My friends James and Gillian called me last night, and they were laughing hysterically, as they said, “you’re on an episode of the Family Guy!” What was my first response? 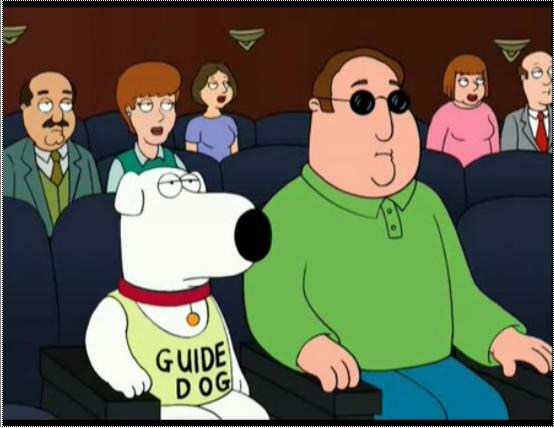 I said, “have you guys been drinking?” They were like, no, I swear, we were just watching The Family Guy, and there was a blind character, and he is totally you! They then found the above picture, and sent it to me. If you have not seen me, or don’t know what I look like, this is a total caricature of me. How bizarre is it that they have a blind guy on the show, and it looks just like me? I am a big fan of the Family Guy, so I guess I am honored in a weird way, just another strange thing that happened in my life. First 90210, now the Family Guy, I guess I am becoming a very very very minor pop culture figure. Of course, I am only kidding about suing, but can I put this on my resume? Nash and I went out for lunch on Sunday with my friend Jewel. I hadn’t seen her in awhile, so we had a lot of catching up to do. Nash was very excited when she came over to the apartment, and I am not sure if he was excited to see her, or if he was just excited to have company over. He said hello to her for a few minutes, and then came back to sit by me. Its always good that he knows who is giving him his next meal. He was very well behaved at lunch, and of course, we went to Matt’s Grill. I guess that has become my new home away from home. Nash and I will be heading to SoFlo in the middle of March for some shows, and to see the family. The parents are very excited, and they will get to Nashify the house, which is pretty much the same as preparing for a visit from their granddaughter Siena, except they don’t have to put the baby seat in the car. We will then head to San Diego for the VIP premiere of the short film VisionZone, and then a few days later the live launch of the company and the website. Not sure if we will be off to LA LA land, as I have to see if I can get some meetings and shows set up. Should be an interesting few weeks, and I will blog more about it as it gets closer. From rainy NYC, Brian and Nash out! He snores, he burps, he sneezes, he farts, and now he has the hiccups! Luckily, he doesn’t fart very often, because the rest of these are very cute. Nash was laying in my bed, and I tried to make a little Nash pillow after I gave him a belly rub, and he started with the silent hiccups. 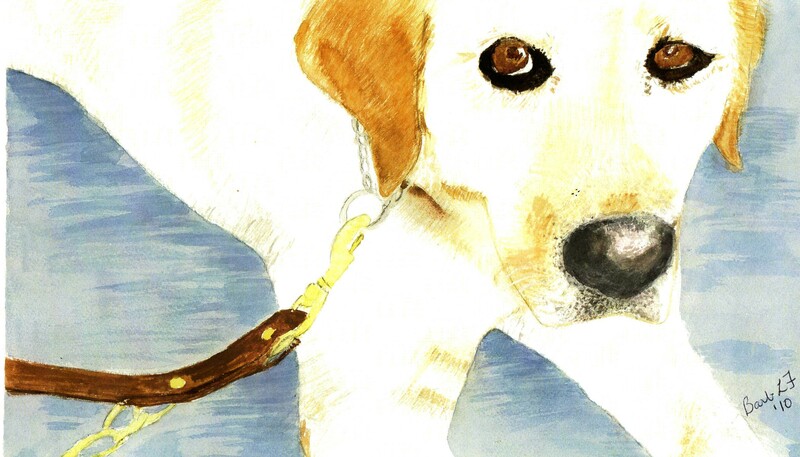 I could feel them, and I didn’t know if I should scare him, as I thought that was one of the ways you get rid of the hiccups, but then I thought, it probably isn’t very smart to scare your guide dog. The hiccups didn’t last very long, and they didn’t really seem to bother him, but after he got over them, I felt it best not to make a Nash pillow. Oh yeah, he also licks, and licks, and licks. He loves to have his tummy rubbed at least once a day, if not more, loves to lay on my stomach and stick his front paw into my armpit in the morning, loves to run his head up and down my back attempting to nudge me out of bed in the morning when he wants to eat and go out. He loves to lay in my spot in the bed before I go to bed to warm it up. He loves to win at tug, or let me let him win. He loves to constantly put everything in his mouth, even if it will end up making him sick. He loves to lay on my feet while I am at the computer, loves to play hide and seek from the blind guy when I am trying to give him his eardrops, which is basically just hide! He loves to eat, and always knows when dinner time is near. He loves to destroy toys even though they are his! He loves to rub the top of his head up against me. He loves to sleep, and sleep, and sleep, but is always aware of where I am! He loves to shed all over my clothes and apartment. He loves going for walks, and leading the way, but most of all Nash loves me! Been dealing with a severe toothache, so this blog is a little delayed, and no, the tooothache isn’t in my fingers, but when you have a severe toothache, it makes your whole body ache. I didn’t even watch Lost last night, not to worry, I have it tivoed, and today my tooth is fine. Saturday night, Nash and I headed over to Matt’s Grill, I kept telling him this wasn’t going to be just a regular night at Matt’s Grill, there was a big surprise for Nashee. I don’t think he got it, althrough he was pretty upbeat when we got there. It was pretty empty, so we grabbed our usual seat at the bar, and waited for Nash’s surprise. Although, I don’t think he knew there was a surprise coming for him, he did keep sitting and looking out the window. Hey Booboo, maybe Nash is smarter than your average bear? Of course he is. At about 630, Nash got really excited, as Lorraine and Richard, his puppy raisers walked through the door with their current puppy in training, Abner. Nash recognized them immediately, as he popped up to say hello to them. Funny thing was, even though Naomi the bartender knew I was meeting someone, she was so surprised as she was like what are the odds that two people with guide dogs come in. Hey to her credit, she was busy. Even though Nash was extremely excited to see Lorraine and Richard, he was pretty well behaved since we were in public, although one brief time, he did try a little leap up to Lorraine. That was the first time he has ever leaped when he wasn’t supposed to, and considering the circumstance, you can’t really blame him. I was just very happy that he wasn’t barking because he was so excited, and luckily, they know me at Matt’s Grill, so it was an appropriate place to meet. After saying our hellos, Nash did calm down, and relax at my feet. He was curious about who is this Abner guy with Lorraine and Richard, and at first we had to keep the two of them seperated, as they were both curious, but by the end of the evening they were practically laying on top of each other and not making a sound .I guess it is all about giving them time to adjust and adapt. Lorraine and Richard were as thrilled to see Nash as Nash was to see them. They commented on how good Nash looked as he has lost weight, since he had put some on. Not really sure how he put the weight on, but I am just happy that he is back to his slender normal self. I even let Lorraine hold Nash’s leash for a little, and one of my only concerns about Nash seeing Lorraine and Richard was that he would want to go home with them instead of me. Sorry guys. It was great to hear that when I did step outside with Richard, that Nash was looking right out the window at me the whole time. I guess we have bonded quite well. It was a very nice evening, and thank you guys for dinner. I and Nash enjoyed seeing the both of you very much, and it was great to finally meet Abner, I guess he is kind of like Nash’s step brother. Abner is a black lab, and he had a different kind of fur then Nash, and yes, Nash and Abner were the big hit of the evening, as people kept coming up asking if they could pet them, and a few people even snuck in a quick stealth pet on their way out the door. I guess they thought Lorraine was blind to. I should have brought my old cane so Lorraine could have wacked those sneaky stealth petters. We hope we see you guys again soon. Excuse me, I’m blind, is there a blizzard? The weather report said there was zero visibility in NYC today, so how is today different then any other day? Oh, I see said the blind man, the weather report isn’t just for me. I have been told that Nash is really more white then yellow, so he must have been blending in quite nicely with the blizzard today. We took a little stroll around the block, and the secret to walking with a guide dog in a blizzard in NYC is baby steps. I think I was walking at a similar pace to my one year niece, Siena. I wanted to enjoy the snow, and usually Nash enjoyes the snow, but he didn’t seem to like it to much today, maybe because it was coming down sideways, and he didn’t like the way it was hitting him. Nash did shovel snow on me today. He was clearing out a space to go to the bathroom, and he started kicking snow backwards with his hind paws, and I’m like, “hey, what did I do, I didn’t throw any snowballs at you this time!” I guess he was beating me to the throw snowing. Smart guy. It was still coming down pretty hard the last time we were out, and I was amazed that it seemed to be more slush then snow build up on the sidewalk. Hopefully there will be a good amount of snow left over tomorrow for a nice walk, as today, I didn’t really feel comfortable crossing streets with the visibility being so bad, I felt it best to just walk around the block. Nash of course was trying to lick all the snow, and I kept telling him, “look, your almost three, you need to stop trying to eat everything, especially stuff that will make you sick!” He still has to put everything in his mouth. Tonight, I was sitting on the floor with him, as Nash seemed like he wanted some close attention, and I was trying to get him to play with one of his toys that he likes to stick almost all the way in to his mouth, and then have me play tug with the little bit sticking out. It was funny because Nash had his front paw over my arm, and the toy in his mouth, he would put it in my hand, and then tug away, and I couldn’t really get a grip because his paw had my hand, and I couldn’t really move it. Not sure how this was fun for him, or much of a challenge, but he kept putting the toy in my hand, and then would pull it out a split second later, then put it back in my hand. Bizarre. Well, we got one more journey out into the snow tonight, and I know Nash really hopes it is coming down, as I think he just likes getting toweled off when we get back inside, as he thinks it is a game, and he likes running back and forth between my legs, and having me run the towel over him. The problem is, I normally end up soaked. Once again its the blind who get screwed, we need a stronger lobby! I was so excited over the weekend, not for the Super Bowl, no, I discovered an app, Kindle for the Iphone. I used to love to read, and being that I have a very limited income, I can’t just go out and drop $395 for a Kindle 2 reader that reads out loud to you. Having an iphone has been great, but also very disappointing. All of the Iphones bulit in features make great use of its voice over technology. I can now listen to my emails and text messages on my phone. In this day and age, people expect you to get back to them immediately, and it doesn’t enter their head, oh wait, he is blind, and probably can’t read an email on his phone, but now with the ophone voice over technology, I can. Responding is still pretty slow, as it takes me forever to type, and you do have to double tap everything, and the phone reads out every letter, so composing a lengthy email can take quite awhile, but hey, at least it is doable. What I have been disappointed with is the lack of all the thrid party software in the app store that doesn’t work with the voice over technology. The good news is Facebook and Twitter both work with voiceover, the bad, several other apps like ESPN scoreboard, the Weather Channel, most games, IMDB, and a ton of other apps don’t work with thevoice over technology, so basically my phone is loaded with a ton of apps that I cannot use. So back to my original point. I was very excited about Kindle coming to the Iphone, as I have heard great things about it, and that it reads books to you. So, I download the app, and spend hours trying to figure out how to work the damn thing. I downloaded some samples of books to test it out, and could not get the kindle to read the damn book to me. I even downloaded a free book thinking maybe it just doesn’t read the samples out loud. Then I find this today. With Kindle for iPhone, you won’t get the dictionary or the text-to-speech feature that you do with the Kindle itself, although Amazon is no longer making text-to-speech available for all books, based on protests from some authors. Great. Thanks authors for saving me the thought of even buying a kindle. If they are cutting out the text to speech on books, I guess the world just expects us blind folks to sit in a dark room and stare at the wall. What do you expect from capitalism. I understand their need to make as much money as possible, but why is it always the blind who end up getting screwed? Well, I got to get running, as I have to go remove the piece of crap Kindle for Iphone application. Considering that it was a birthday week, it was kind of an uneventful week for Nash and me. Now when I say birthday week, I don’t mean that I am one of those strange people who celebrates their birthday for an entire week. I never got that. I mean my birthday was February 2, and my Mom’s was February 6th. Unfortunately, my Mom is in Florida, and we were in NYC, so we did not get to celebrate together. I did get an insane amount of Facebook bday wishes, which tells me three things, one I am very popular online, two, I better start paying attention to when it is other people’s birthdays, and three, I need to spend less time online. I did like hearing from a lot of people that I had not heard from in awhile. And yes, being born on the biggest holiday of the year, Groundhog Day, I do see the irony, I have never seen my shadow! For those of you who are curious, Nash’s birthday is March 31, and it is looking like we may be in San Diego for Nash’s birthday, as the short film that I did VisionZone is going to premiere in San Diego at the end of March. Unfortunately, they are going to premiere the film in San Diego, and not San Antonio, so no Alamo for Nash and me. Luckily, San diego is gorgeous, so its not that bad. Wow, where did the day go? I started writing this blog this morning, and then got sidetracked playing with some new apps for the iphone. I downloaded kindle for the iphone, but am not sure if it reads books to you out loud, and for me that was the whole point. If anyone uses kindle on the iphone, let me know. I have only downloaded samples of books, and it doesnt read those out loud, and don’t want to spend the money on a book that I can’t see. Also, does anyone know what the difference is between kindle and an itunes audiobook? Seems like they are pretty much the same thing. Anyway, I did want to write more about Nash and my week, but it is getting close to Super Bowl time, and I have to get a few things done before Nash and I head out to watch the game at Matt’s Grill, as they are having a Super Bowl party. I just hope they are playing the audio to the game, as they usually play music. If they aren’t, we may be just watching the first half there. Hopefully this week will be more exciting so we will have something interesting to blog about. Back to posting in real time, or as close to real time as I get, you know the day of things happening. I wanted to share a portrait that my Mom painted of Nash, we are calling it the Mona Nashee for a lack of creative naming. Let me know if you have a better name, as we could run into a frivolous lawsuit, as I think someone may be calling some painting by a similar name. For now "The Mona Nashee"
Last night I went to give Nash his ear drops as we are still doing that, and he picked up a bad habit at Steve’s in California. He learned with all the space in Steve’s apartment that if I can’t find him, I can’t give him his drops. Nash was sitting in my bed when I attempted to give him his drops, and he began running laps around my bed. I would be on one side, and he would run to the other side. Then I would walk over to the side he was on, and he would run to the other side. I guess he figured, if I couldn’t catch him, I couldn’t give him his ear drops. He used to not mind them, but I guess he just tolerated them, and now he is sick of them. Not to worry though, he didn’t blame me, as he still slept in my bed, and woke up on top of me this morning, and is currently curled up on the floor on top of my foot, so I guess he doesn’t hold a grudge for very long. Been getting caught up on everything on tivo. I don’t think you realize how much tv you watch until you go out of town for two weeks. I am still no where near caught up, it doesn’t help that I have been watching all of last season of Lost as well, as that is my favorite show, and I want to be fresh on every detail heading into the last season which starts tomorrow night. Lost and Seinfeld are my two favorite shows of all time, so I can’t wait for it to begin, but am sad that it is ending. Nash and I went for a nice walk today, as it has warmed up, it is in the high 20’s, yippee! I can feel my fingers, and don’t even have gloves on. Nash loves the cold, and started off at a real quick pace, of course, he still hasn’t learned to pace himself, as on the way back, he puttering a little bit. At least he didn’t try and eat anything like last night, when he had the top of a plastic ketchup container in his mouth. I said to him, Nash you are going to be three soon, when are you going to stop putting everything in your mouth? He tries to eat everything, and still sniffs constantly. I hope he eventually grows out of it. You are currently browsing the Blindgator's Weblog blog archives for February, 2010.